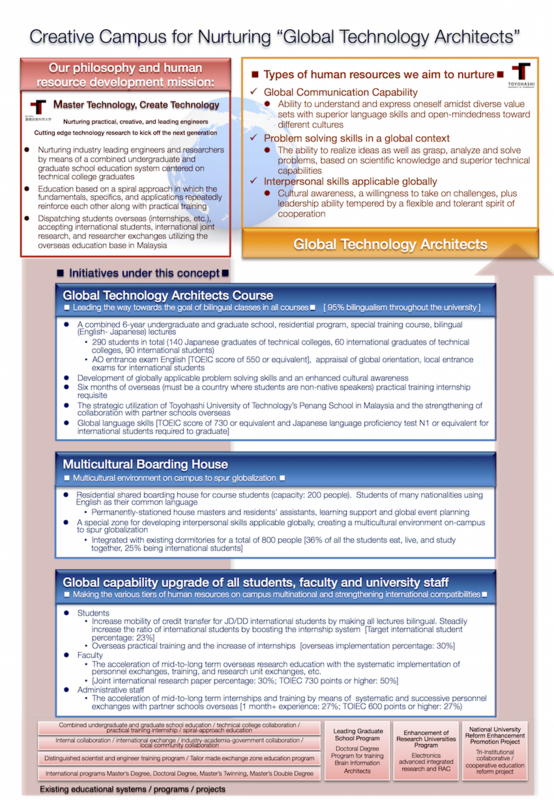 Creative Campus for Nurturing "Global Technology Architects"
The Top Global University Project founded in 2014 aims to enhance the international compatibility and competitiveness of higher education in Japan and promote a complete internationalization in cooperation with excellent foreign universities and university reform. This project provides prioritized support for world-class and innovative universities that lead the internationalization of Japanese universities. The selected universities are classified into two types. Type A (Top Type) includes universities that conduct world-leading education and research, while innovative universities that significantly contribute to the internationalization of Japanese society were selected as Type B (Global Traction Type). 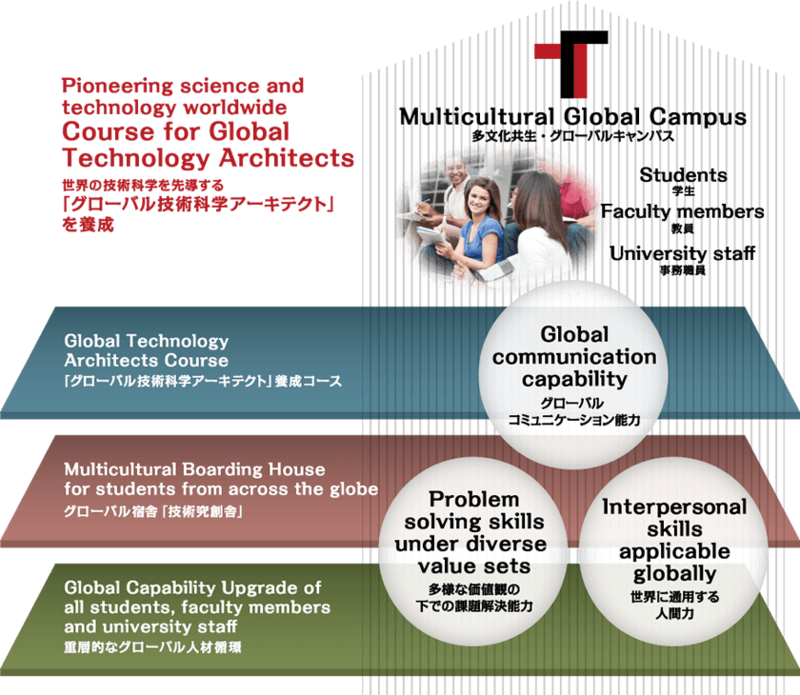 Our university, Toyohashi University of Technology, was selected as Type B.
Toyohashi University of Technology attempts to produce 'Global Technology Architects' and create a 'Multicultural Global Campus' through the following initiatives on the 'Top Global University Project'. In this course, the students study in both English and Japanese (bilingual lectures) to obtain their B.A. and M.A. degrees. They belong to one of the five departments. The educational program includes learning/training at our overseas education base in Malaysia and overseas partner universities. Japanese and international students use English and Japanese as their common languages and foster their communication skills by living together in this multicultural environment where diverse values coexist. Multiple buildings of a communal style of housing design and construction starts in 2016. Multiple buildings can accommodate a total of 180 people. A special zone will be set up where 800 people (36% of the total student body) of diverse cultures can eat, live and learn together on-campus in the existing student apartments and the international accommodation facility. Ensuring that the students, faculty and university administration staff, on their various tiers of on-campus human resources establish a two-way connection with the global stage, mostly through the portal of the university's overseas education base at Penang, Malaysia, as well as many partner schools overseas. We aim to construct a global educational / academic affairs system and to develop intercultural communication competence with students, faculty and university staff.